Newly remodeled and top of the line condo with tons of amenities and close to the slopes. Graysill 203 - 3 Bedrooms - 3 Bathrooms - Sleeps 7+ - Deluxe Condo Newly Remodeled - One covered parking space and only a two minute walk to skiing (Chair 7 - Telluride Ski Resort). There is a common hot tub on site and it is open between December 1st and April 1st. Located directly across the street from Lift 7 and the San Miguel River, this luxury condo is ideal for all seasons! Completely remodeled in 2008 with custom cabinetry and built-ins throughout, high-end appliances, Wool Carpet and Flagstone floors, Graysill 203 is one-of-a-kind. Occupying two levels, this three bedroom condo has one bedroom and bath on the main level, a remodeled kitchen, living room with vaulted ceilings and open dining area. 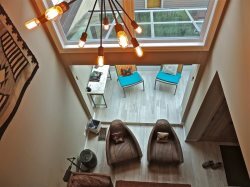 On the upper level, there is the master bedroom and private bathroom, plus a guest bedroom with an ensuite bathroom, a heated private covered deck and a separate office. The Graysill 203 is one you don't want to miss! We strive to create a seamless vacation experience that you'll never forget. From our hand-selected, meticulously maintained properties to our exceptional concierge services backed by local knowledge, we will help you choose the best property to accommodate you. Once you have booked, we will coordinate the details of your trip and provide any complimentary concierge to you and your family. On the day of your arrival, our team will greet you at the front door of the property to welcome you to Telluride and then provide a tour of your vacation home. Simply put, we will make sure you have everything you need during your stay in Telluride. • Damage Protection: $79.00 – Protects you up to $1,500.00 in accidental damage, theft or lost keys to a home.